Specificity/Sensitivity: GTX29165 shows <1% cross-reactivity with other mouse subclasses by ELISA. 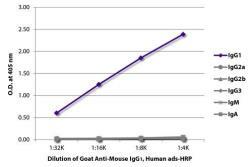 Specificity/Sensitivity: This antibody has been pre-adsorbed against Bovine, Human, and Rabbit Serum Proteins to ensure minimal cross-reactivity. Cross-reactivity with other species, however, is possible. 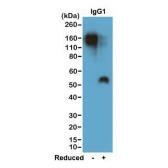 Specificity/Sensitivity: This antibody recognizes the gamma 1 heavy chain of mouse immunoglobulin.